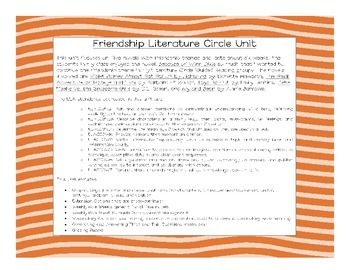 This unit focuses on 5 different novels that incorporate a sense of friendship and lasts about 6 weeks. 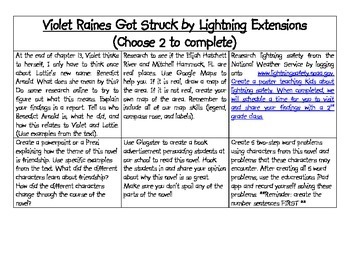 The unit includes a graphic organizer for each book that asks about the characters, character descriptions and traits, settings, climax, problem, and solution. Also, each novel includes extension options. Furthermore, the novels were broken into a 6 week unit. Each week, the students use context clues to determine the meaning of given vocabulary words. Students fill in page numbers where the word was found, guess what they believe the meaning of the word is using context clues, then look up words in dictionary or online, and determine if guess was correct. 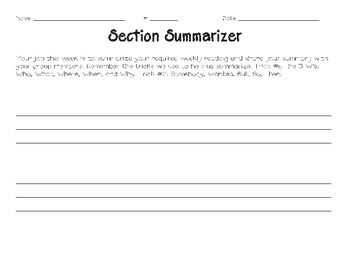 Included in this unit is a lesson plan for the 2nd week of the literature circles. The lesson involves generating and answering thick and thin questions.